A dog fight often shocks the owner. Suddenly, the pet who is so sweet and loving at home is all tooth and claw. The best way to respond to a dog fight is to prevent it from happening in the first place. Socialising your puppy to other dogs at parks or on walks can help your pet learn how to interact with other members of its species. Don’t force interactions if your dog is shy. During meet and greets, notice whether your dog seems comfortable with his new friend’s advances. Let him play if he’s enjoying it, but let him back away if he acts as if his new mate is a bit rough. A stroll or visit to the dog park should be relaxing, but don’t ignore your dog altogether. It’s fine to talk to other owners or glance at your phone, but keep an eye on the activity. You may notice a dog who is a bit aggressive or overly-protective of a toy. Watching out for this behaviour can allow you to head off problems. 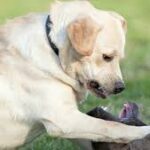 Of course, normal dog play can involve growling and other behaviour that appear threatening to humans, but observing will help you understand the difference. If your dog is prone to fights, it can help to avoid interactions as you work to teach him to socialise. It’s OK to cross the street if you see another dog coming and you are just not sure how yours will react. Other dog owners can be oblivious and fail to understand that you are trying to avoid an interaction. If you notice this happening, don’t be shy. You may need to say in a loud, clear voice, “I’m sorry. My dog doesn’t always do well with other dogs” and head in the other direction. Analyse what seems to prompt aggression in your pet. Many are fine in a dog park but fearful on a leash because it limits their ability to run from perceived danger. One of our walkers had a dog who fought occasionally. She was mystified as to why her sweet Spaniel wagged her tail and played with some dogs but attacked others. Gradually, she noticed that her dog sometimes got into a staring contest as another dog approached. This behaviour led to fights, so when it happened, she crossed the street. If the stare down did not occur, she knew her pet could safely say hello. Your dog may have triggers like this. Knowing them will save you a lot of trouble. Teach your dog to come when called so that you can bring her to your side when combative signals occur. If your dog does get into a fight and you feel like you have to intervene to avoid injury, do not do so directly. If a hose or bowl of water is nearby, gently direct it toward the fight. Branches, a dog toy, or even your coat can serve as tools for separating fighting dogs. Just be sure to avoid reaching for a dog’s head or collar, as this increases the chances that a dog will bite you. If grabbing your dog is the only option, try to gently lift and pull him by his back legs. When the fight is over, check your pet for injuries. Even a small wound may require veterinary care to head off infection.